Have a question that is not answered below? Please contact studentchapters@aisnet.org. Click here for information on submitting your annual report. Reports for the 2014-2015 academic year are due May 6, 2015. Enter your username and password in the available fields and click sign in. After you login, you will be taken to your chapter’s profile page. On your profile page, click the Groups link located on the right under My Profile. You will now be presented with the My Groups page. Here you are able to view all the groups available to you. The icon located to the left of the group name suggests that you are an administrator for that group and may edit related content. Select the name of the group you wish to access. Click Group Admin Options. 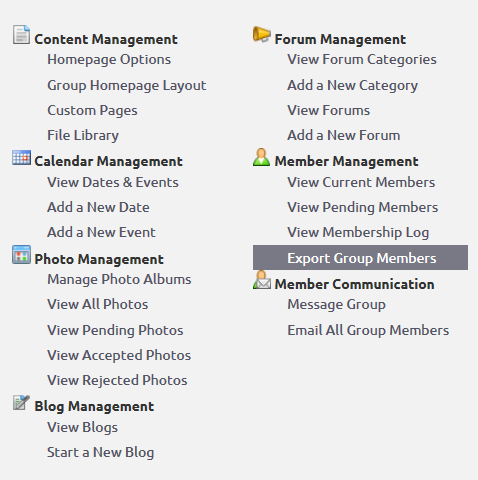 In the group admin options, among many other options, you will see a member management section. Select Export Group Members. A popup window will appear, alerting you that the file is ready for download. Enter your chapter’s username and password in the available fields and click sign in. From there you will be taken to your chapter’s profile page. On the right side of the screen under My Profile, select Profile Home. The following screen will appear. On the top Professional Information blue header, click “EDIT”. Change the appropriate officer information and click on the Save Changes button at the bottom of the page. Please Note: You may receive an error message if all of the required information is not filled in. Please fill in what information you have. If you are unsure or do not have it, don’t worry. The information was saved after you selected the Save Changes button. Enter your chapter’s username and password in the available fields and click sign in. From there you will be taken to your profile page. On your chapter’s profile page, click the Groups link located on the right under My Profile. You will then be taken to the My Groups page where you are able to view all of your groups. If an icon appears to the right of the group name, you/your chapter are designated as an administrator for that group. Group permissions at the bottom of your page indicates you know what group type you may join. To access a group simply click on the name of the group. Enter your chapter’s username and password in the available fields and click sign in. After log in in you will be taken to your chapter’s profile page. On your chapter’s profile page, click the Groups link located on the right under My Profile. You will then be presented with the My Groups page where you are able to view all the groups available to you. The icon located to the right of the group name suggests that you are an administrator for that group and may edit related content. Select the name of the group you wish to access, and then click Group Admin Options. 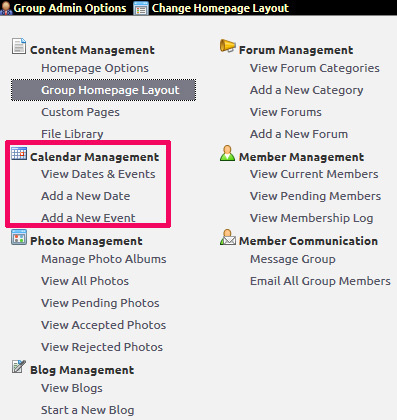 In the group admin options, amongst many other options, you will see a Calendar Management section. Under the Calendar Management section, you can choose to view events & dates, add a new date, and add a new event. Make the desired selection from the list of options, input the appropriate information in the available fields, then click submit. Enter your chapter’s username and password in the available fields and click Sign In. You will then be taken to your cchapter’s profile page. On your profile page, click the Groups link located on the right under My Profile. You will then be presented with the My Groups page where you are able to view all the groups available to you. The icon located to the right of the group name suggests that you are an administrator for that group and may edit related content. Select the name of the group you wish to access and then click Group Admin Options. 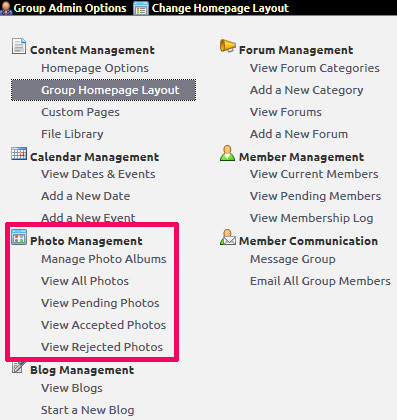 In the group admin options, amongst many other options, you will see a Photo Management section. Under the photo management section, you can choose to manage photo albums, view all photos, view pending photos, view accepted photos, and view rejected photos. Select the desired operation from the list of options and click accept when finished. Your chapter’s AIS website login provides you the access you need to make changes to your chapter’s website, blog, photos, calendar, etc. Your chapter president and chapter advisor will have access to this information. There are three ways to add members; select the one that you wish to use. 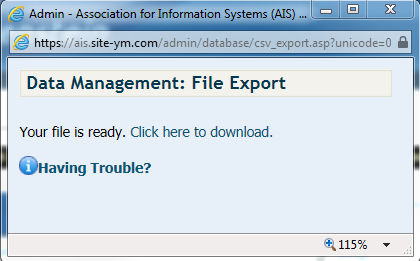 Log in to the AIS website with your personal credentials. 3. Make sure to click “Save Changes” at the bottom of the screen when you are finished updating your profile. 4. To change your profile photo, go to “Profile Home” and click on the box on the left of the screen. Follow the instructions for adding a photo.